MEDFORD, Ore. — Candidates for Jackson County Commissioner gathered today at the Medford City Council Chambers. The group, answering questions about a number of topics, from the housing crisis in the Rogue Valley to forest and fire management. Candidates only had a minute or a minute in a half to answer questions. 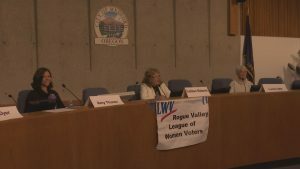 The League of Women Voters of the Rogue Valley sponsored the event.